I'm in the middle of trying to re-topologise a dragon I'm working on,I figured i'd start with the hardest part first, the head. The problem is I've got a ton of horns and teeth to do, and the teeth are an absolute pain to do. My first question is - would it be more beneficial to do the teeth as a separate object, or should i continue making the mesh all one object? The second question is if i made them separate, would this help or hinder the baking and texturing process? the only downside i can see to making them separate would be the baking of the border between the teeth and the gums, plus would baking AO need to be done separate too? I'm hoping some wisdom could help me with this predicament! got an image below so you can see the situation atm, I'd be grateful for any advice on the topology as I've attached too seeming as I've never done a dragon head before! 1) I would rather do seperate parts of it as it saves some polys, because of intesections between the mouth and teeth as one mesh requires more extra polys to get the correct shapes and flow. Also it might be better for uv-mapping and texturing later. I would do them as contiguous geometry. Easier to bake and intersecting triangles never looks very good. Yea teeth and horns are a pain. No real way around it. I agree it would look better as 1 mesh BUT it depends on if that really matters. If the teeth are only going to be 5 pixels on the screen save some time and make 1 > UV it and duplicate it around > FFD/Shrink Wrap them in place. You could even do this and then build the gum geo around them and weld them later. It would probably be faster than building them all uniquely and they would be UVed as well. I wouldn't retopo the small teeth details. However try your best to keep geometry set up in those areas so you can just extrude them out really quick in max/maya. 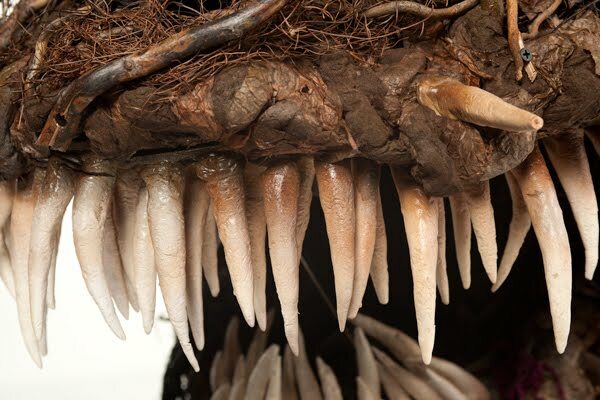 For example, I see edge loops around lower jaw teeth and those could just be collapsed poles, which you can later chamfer into that shape, then extrude them out. The main thing to worry about is transition of flesh to teeth and if it's for game then you really shouldn't worry a lot about it. That's for polishing. Similar goes for the horn, just have the geometry there to support modelling it out in max/maya like the teeth. Unless you're going to have really specific color grading set up in your texturing process (like Darksiders) I would build 1 or 2 horn variations, and 2 teeth variations based on your model and then bake those out and place them in their correct spots after baking. If you don't sweat the small stuff, you'll save tons of UV space and texturing time, as well as saving yourself the headache of setting up "proper" geo to make a watertight mesh. It's also a lot easier to edit later in separate pieces. I figure that about 9 times out of 10 when you're working with repeated details like teeth or horns that already look similar, if you keep the texture fairly generic, nobody's really going to notice if they're clones or mirrored details.